For the most part, we all have this idea that there are “close to perfect” Christians and churches out there. It’s safe to say that none of us truly believe that there are perfect Christians nor are there perfect churches, but sometimes, subconsciously, we believe they can be “close to perfect”. We all have this mental checklist that we carry around and pull out as often as we can put it to use. 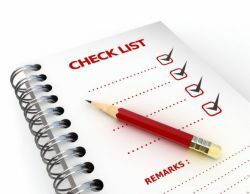 We may not realize that we have these checklists, but deep, inwardly most of us do. This is nothing new to the church though. The Jews have a long history of checklists. Simply read through Leviticus and you will find chapter upon chapter of laws for offerings, disease, feasts, and so much more. These things were the guidelines by which the Jews lived, and died. These are the lists that determined their level of holiness and righteousness before the Lord, and how often do we do the same thing? We keep track of how often we, or others, attend church, how much we tithe with our money as well as our time in service, we make mental notes of our good choices, and all of these fall into our invisible checklist that determines if we’ve pulled enough points to make it closer to perfection. We do the same thing with the church also. We analyze how a church leads worship, organizes service, what extra activities they offer, how well the pastor speaks, and what they spend their money on. It’s too easy to spend our lives walking around judging ourselves, others, and the church. This is something I unknowingly struggled with for quite some time in life. The body is ONE entity comprised of MANY members. Each member completely unique, completely different from the next, with their own purpose in the body. Vs. 21, “The eye cannot say to the hand, ‘I have no need of you’; nor again the head to the feet, ‘I have no need of you.’” These were the very verses stung me to my core. Here I was walking around, checking off my lists for myself, other people, and so many different churches and my conclusion, more often than not, was: I have no need of you. If someone rubs us the wrong way or doesn’t seem to be putting enough hours in, or if a church doesn’t do something just the way we think it should be done, how quick are we to say, “I have no need of you”? Now lets interject here, this by no means has any regards to things true and holy in God’s word. The Lord is very clear in His word about what things He commands from His people and the church. To deviate from the foundational truths of Christ would be to sin. Here, we are talking about the things that are relational; those things which vary from each, individual relationship with the Lord. The things like, which kind of worship music to play, whether a pastor teaches topically or verse-by-verse, what kind of clothing you wear on Sunday mornings, etc. The things that have no affect on whether Christ calls us His child or not. These are the things that we can be so quick to judge, and I was. What an ugly, angry heart I had for so many years. I had no idea my heart was in this state, for it was masked with “holy” intentions and a sense of “humility”. Can I just say, Praise the Lord for his grace and mercy and continuing sanctification. We must allow the Lord to open our eyes to the beauty in the individuality of each Christian and church. We may not connect with every person or feel at home in every church, but just because we don’t, we do not have the right to say “I have no need of you”. There are many different members, each functions differently, but in whole, it completes the beauty of Christ in one body. That body can only function properly if each member sees the absolute need for the other members of the body and can rely upon one another. We must be united in Christ, without judgment and condemnation, having a pure, unselfish love for one another. Vs. 26, “And if one of the member suffers, all the members suffer with it; or if one of the member is honored, all the members rejoice with it.” May the Lord change our hearts and open our eyes, and the next time we pull out our checklist, may He destroy it and allow us to walk in purity of heart.